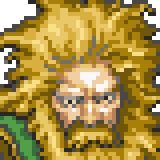 Banon is the heavily-bearded leader of the Returners, a resistance movement working against the Empire. He resides in the Returners hideout east of Mt. Kolts and is an associate of Locke and Arvis. Banon is a member of your party briefly after the group leaves the Returner's hideout via the Lete River. He can attack with his Punisher staff and perform the useful Pray technique, which heals the entire party by a moderate amount for zero MP and no wait time. Just have him use Pray every turn; the Punisher staff doles out surprisingly little punishment.